Beogram 4004/4002 were two integrated record players with identical technical specifications and performance, but Beogram 4004 had additional convenience in that it could be operated by remote control when coupled to the Beomaster 2400 receiver. It could also be linked to the Beosystem 6000 as part of a quadraphonic system. 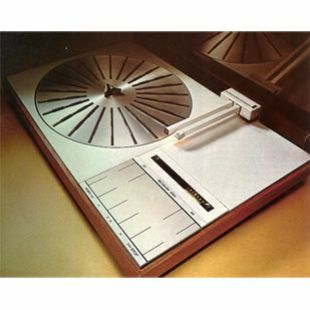 In terms of concept, performance and technical design, these record players were very much ahead of their time. All functions were governed by computer-like logic circuits. You just pressed START, that was all. Through the unique detector arm (parallel to the pickup arm) these circuits could judge the size of the record, determine its normal playing speed and instruct the pick-up arm to lower the stylus into the lead-in groove. Within a few seconds you would hear the music. If there was no record on the platter the stylus could not be lowered, so the system was safe as well as simple. Records could be tracked more accurately because the tangential arm traced a straight line from the record's edge to its centre, instead of tracing an arc as radial arms do. This method entirely eliminated inward bias (skating effect) and tracking angle error was almost non-existent. The naked elliptical diamond stylus in the MMC 20EN (former MMC 4000) pickup cartridge helped ensure that Beogram 4004/4002 got all of the information out of your record grooves while handling them in the gentlest possible way. Speeds: 33 - 45 rpm.